Tablankets make every picnic better. You’ll Never Go Outdoors Without It. Ever Again! Tablanket is an all-in-one table and blanket, that collapses and folds into an easy-to-carry case. Sturdy Tabletop. Integrated Blanket. Folds Into a Case. As sophisticatedly as the human race has evolved, we still find ourselves doing things on the ground or floor. Whether it’s enjoying nature, playing with our kids, tailgating at a ball game, picnicking, or just lounging around, our lifestyle of sitting, dining, relaxing, and being active on the ground should be comfortable as well as convenient. 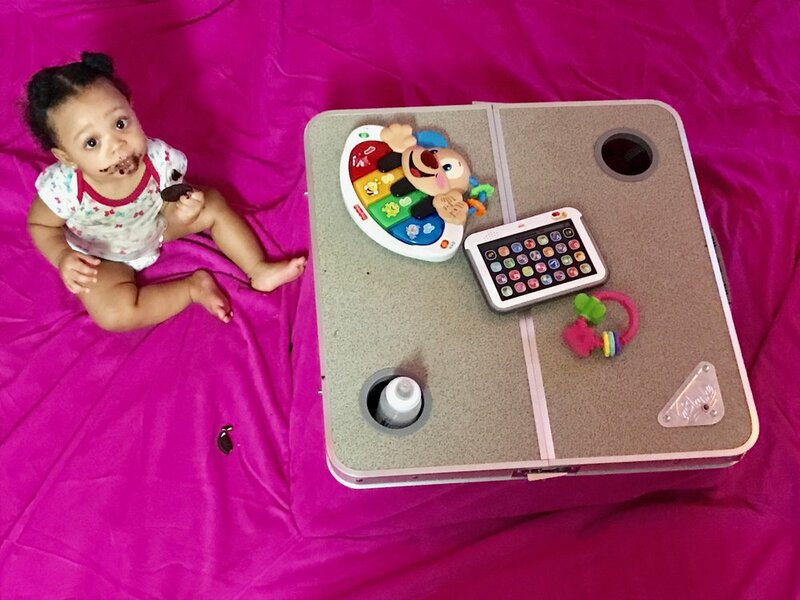 The Tablanket offers such a solution by combining a plush, water resistant blanket with a stable hard top surface to put our “things” on, be it food, drinks, toys, electronic devices, or whatever we humans interact with. And then the beauty is when you’re ready to go, Tablanket folds up into its own compact carrying case that is lightweight and easy to lug around. 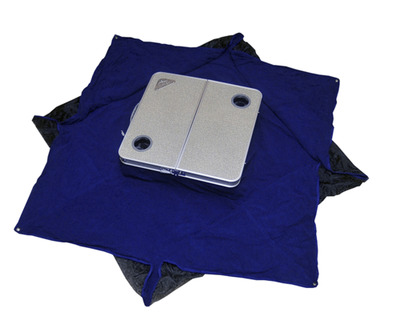 Spill a drink or have a messy accident on the blanket, no worries, the blanket can quickly be unzipped from the table portion, machine washed and dried, then zipped back on in a matter of seconds, ready for your next outing. Simplicity and necessity is the mother of all invention. Tablanket is the creation of its inventor, Ty Dyson, and then brought to life by his business partner, Gary Nightingale. While residing across the street from both NFL and MLB stadiums, Ty Dyson often noticed during every home game the number of fans sitting on the ground enjoying their pre-game activities, and where he also noticed these same fans needing a place to put their food, drinks, and other personal items besides the ground. A blanket just wasn’t cutting it. These same fans also required something mobile, so when the game started, they could pack up and enter the stadium. This started the gears turning with Ty, where he realized not only the tailgater could use a more sophisticated product, but any outdoor enthusiast, or even indoor user, who sits on the ground or floor could benefit from his invention. Ty dreamed of the idea of combining a folding table and blanket into an integrated product that was simple, lightweight, compact, and washable. Having created a patented conceptual design, Ty then approached Gary Nightingale, who specializes in China manufacturing and new product start-ups, to help bring his idea to the mass market. Thus began a blossoming partnership of ingenuity, execution, and hard work to introduce a truly unique and practical product to almost every human being, from infants to grandparents.